I used: Sonburn cardstocks, glitter+strawberry+ladybug papers that were borrowed and I don't know their source, Fiskars border punch & decor shapes - cardstock stickers, Studio G clear stamps, StazOn jet black, Sharpie, tag (from something I bought or got somewhere in the past year or two, tag chipboard, heart shaped brad & butterfly. 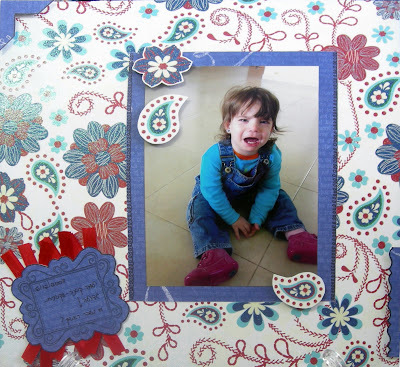 I used: Sonburn cardstock, Miss Elizabeth's Tom Boy Princess & Birthday papers, other paper I can't recognize (the bottom strip of paper), Fiskars border punches, ribbons, Prima flower, Chatterbox flower, button, thread, Sharpie, pearls. 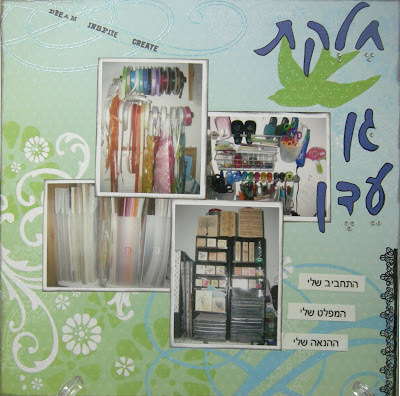 On Thursday (Dec. 24th) I was in Tamar's house for a workshop: create layouts using scraps. This is the first layout I created mostly from strips of papers. I used: Autumn Leaves patterned & solid papers, DCWV papers & other scraps I can't recognize their source (sorry!! 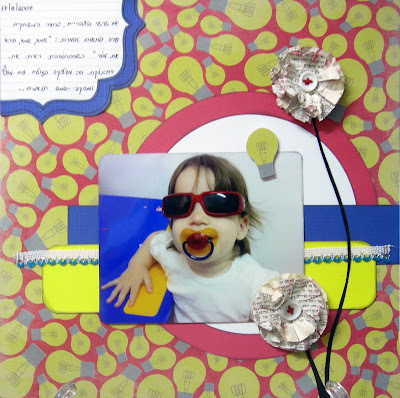 ), Coluzzle, Fiskars border punches & button chipboard, Sharpie, Dew Drops. 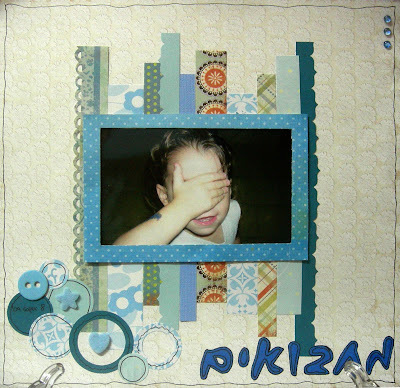 I used: DCWV (Whimsy stack), Unity stamps, StazOn jet black, Ink it Up! black ink, JustRite pre-inked stamps, bling, Sharpie, Brother P-Touch. The journaling says: Friday morning, ready to go to kindergarten: this is the only day of the week that it's allowed to go with dress & skirt... All the girls arrive like sweet little princess. I used: DCWV papers (the Spring stack), sonburn cardstock, Fiskars border punches, Ink It Up - blue, StazOn jet black, Unity stamps, Sharpie, Imaginisce I-Top. 1. 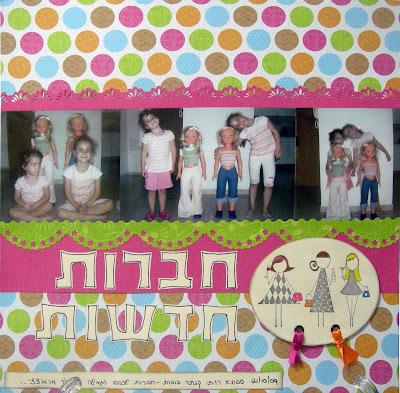 Mix & Match - Israeli challenges blog - combination challenge (I chose: theme - children, colors - white-pink, elements - lace, ribbon, flowers, black bling. I used: DCWV paper (the spring stack), sonburn cardstock, Fiskars circle cutter, lace & ribbons, crochet flowers & buttons, stapler, black bling, Ink It Up! black & pink inks, Stampendoues embossing powder, Tim Holtz distresser tool, StazOn jet black, Unity stamps. 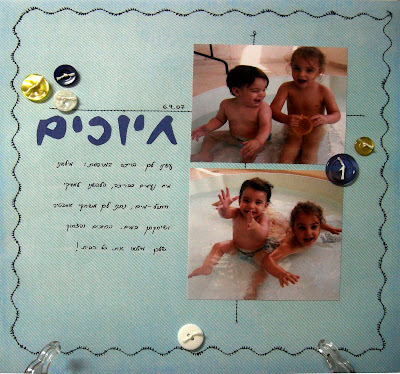 The journaling says: we made you a pool in our balcony: We filled it with lukewarm water, dressed Mor with a water-diaper, gave you the bathtub games and you played in the water. Your smiles and laughter filled our house! I used: DCWV (the Spring & Summer cardstock Stacks) - I sewed paper for the first time :-), buttons, thread, Sharpie. 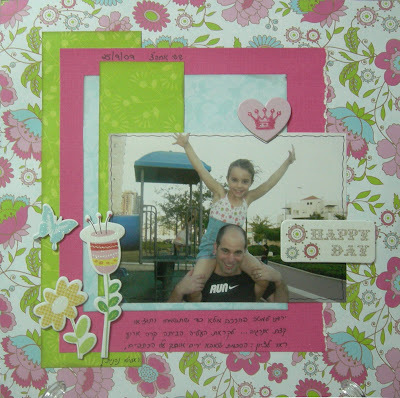 I used: DCWV (the Spring & Summer cardstock Stacks), Fiskars border punches, shaped scissors, Coluzzle, Ink It Up! black ink, Sharpie, ribbons, Unity stamps, StazOn jet black. My second sewing project - Bird, isn't she adorable?? I know, I have to get better, improve my sewing by practice more & more.... But I love her! The journaling says: The whole family went down to the park, so you will be happy, have fun and burn some energy... Few minutes prior going home an historical event happened: You agreed that daddy will put you on his shoulders and you even enjoyed it! 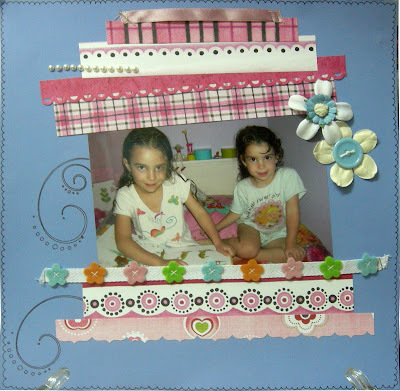 I used: DCWV (the Spring & Summer cardstock Stacks, the Spring Chipboard embellishments), Sharpie, Ink It Up! black ink. 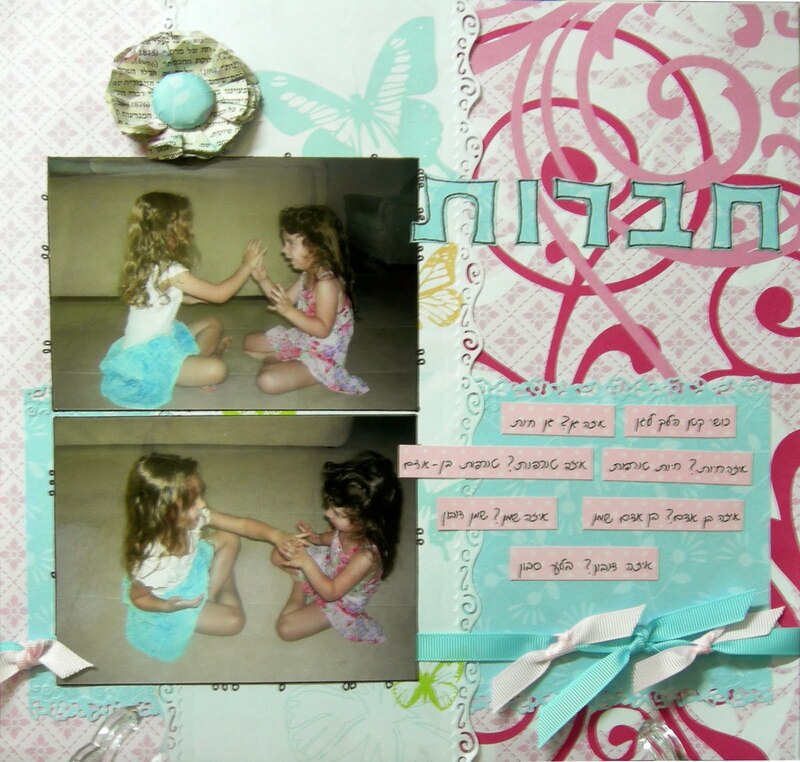 This layout was inspired by Anat's December Challenge: White space layout. 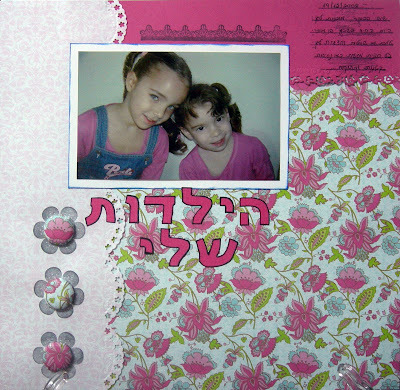 I used: Sonburn cardstocks, Page Accents wave-border, ribbon, stapler, clip, crochet flower, pencil from ikea, Sharpie. 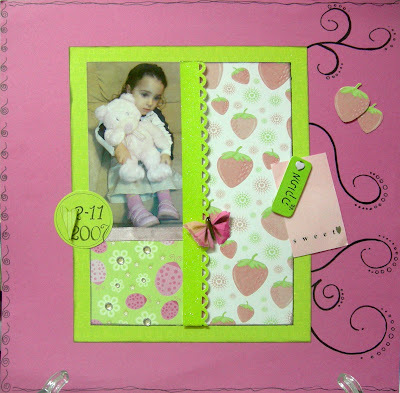 I used: DCWV Spring Stack, Fiskars border punches, grosgrain ribbons, Sharpie, Imaginisce I-Top & recycle of the back of stickers pack (the pink polka dots strips of the journaling). I used: DCWV Fun in the Sun Glitter Stack, Unity stamps, StazOn jet black, Sharpie, ribbon.